Leading the South Eastern Women’s Football (SEWF) team into battle for its historic first interleague game against Northern is an honour not lost on Cranbourne’s Emily Wallace. 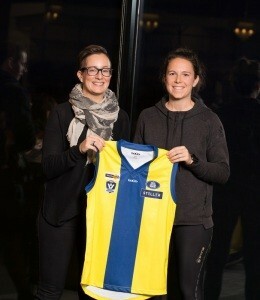 The smooth-moving 25-year-old was named the inaugural captain of SEWF by interleague coach Megan Snart at a jumper presentation ceremony held at Frankston Park on Wednesday. The SEWF girls will take on the Northern Football Netball League in a high-noon shootout at Preston City Oval on Saturday, May 19. Wallace, who began her career at Cranbourne Youths at the age of 16, and played in a premiership with the club in 2010, was thrilled with the appointment. “It’s a massive honour and I’m really happy right now, I’ve never been involved in anything like this before and it’s been really good just to be a part of it,” Wallace said. Wallace said her second shot at football had been a real eye-opener. “I had a few years off and just couldn’t believe the development of women’s footy when I returned,” she said. The SEWF skipper said she was looking forward to playing an unknown opponent and would trust her girls to get the job done. “We’ve obviously never played them before, we don’t know their quality or their style of play, but at the end of the day we have to back our girls in,” she said. Wallace highlighted the skills of Seaford’s Jess Johnston and the Eastern Devils Olivia Aing as x-factors that could get her team across the line. In a great sign of the overall depth of the league, a total of 10 SEWF clubs will be represented against Northern.